You should be aware of these electric scooter questions before or even after you have purchased a scooter. The sooner you realize your own personal scooter requirements and your own local laws on driving a scooter, the better you improve your quality of life. Is A Scooter Right For Me? Based on your handicap, a scooter might end up being a hindrance than an aid. You should have sufficient upper body strength to reach the controls of a scooter in order to drive. You should also have enough strength to exit and get on a scooter’s seat. Make sure you have no problem sitting for extended periods of time. 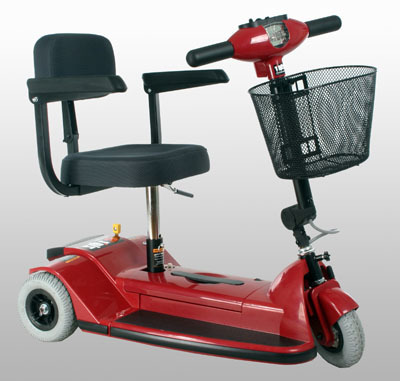 The regular users of scooter tend to be the elderly, have some moderate arthritis, pulmonary or cardiac problems, trouble walking distances and experience fatigue easily. Should I Buy A 3 Wheel Scooter Or A 4 Wheel Scooter? If you live in a home with sharp turning corners, the number of scooter wheels is a crucial decision. With fewer wheels on a mobility scooter, you are able to maneuver around at sharper angles. Without turning angles, even with a scooter, you will remain immobile and unable to access tighter areas. This is why the choice of 3 or 4 scooter wheels is a very important purchase. How Do I Transport My Electric Scooter? You can get van or truck to be your handicap scooter carrier. Make sure the scooter transportation van has enough space for both the wheelchair ramp or lift and scooter. The more popular vans and trucks people purchase to carry their electric scooters and power wheelchairs are the Toyota Tundra, Dodge Grand Caravans, Ford Galaxy, Ford Windstar, and the Chevy Uplander. Some of these transportation vehicles have rear-entry or side entry door modifications for easy entrances and exits. If you prefer there are many transporting companies that will drive you and your scooter to your planned destination for a reasonable rate. For an electric scooter, normally, it will not require any insurance. However, this depends on your local laws. Some areas may require you to purchase insurance before you can legally drive it out in public. When you purchase scooter insurance, people tend to feel more comfortable in their surroundings while out driving. As you know, scooters can get expensive without insurance or Medicare, so any damages to the handicap scooter will be costly and leave you immobile for a while. So it is extremely recommended to have some, in the unlikely event, that the mobility scooter gets stolen or damaged by someone or something. We cannot predict the outcomes in life; we can only limit the harms by protecting ourselves. Scooter insurance protects our wallets. Mobility scooter owners occasionally experience problems with their vehicles. Instead of sending it off for repairs for every little hiccup, maybe you are having these troubles. When you notice your handicap scooter having problems going downhill, do not be alarmed. This is a built in safety feature that limits the chance of you speeding up and flipping or tilting over on the downhill drive. The scooter is an aid for mobility impaired people and this added feature prevents tipping. If for any reason the scooter tipped over, the person could be in a situation where they are unable to walk for help if no one else is available to assist. There are many good handicap scooters on the market. Here are a few recommended handicap scooters to buy. If you are noticing your scooter batteries are losing the charge quickly even after you charged them overnight, try cleaning the connecting cables. Power loss on a battery might be due to dirty cables that are providing a poor connection. Second, check if the problem lies in the battery charger. A broken scooter charger will not charge the battery to its full capacity. Make sure to check for loose cables too. If you are unable to figure out the cause of the leaking power, contact a technician to determine the source. You may have to replace the scooter battery, scooter battery charger or both. You can buy low priced handicap scooter batteries online. Here are a few recommended scooter batteries. Find out where the squeak is coming from and put a dab of grease on that area. A spray of WD-40 will also help in clearing out some rust and stuck on debris. Keep your scooter clean whenever you return from a trip outdoors. Any water, oil or dirt buildup can create problems in the future. Cleaning and clearing out debris on your handicap scooter will increase the lifespan. Get a bottle of canned air and spray the little holes. Check all the moving parts like the axles and belts. Wiping down your scooter after coming back from the rain will also help in preventing potential rust. If your handicap scooter is experiencing problems beyond repair, you should consider purchasing a new scooter with a longer warranty than the standard 1-2 years. Before you purchase it out of pocket, check if you can qualify for Medicare. For durable medical equipment, remember that Medicare can pay for 80% of the total cost. Another alternative is to buy used handicapped equipment from owners who recently upgraded or had a temporary disability and no longer require its use.